Growing up in Kitchener, Stefan has been involved in athletics his whole life and has been extremely passionate about sports. Through a love for the game and many years of hard work, Stefan particularly excelled in the sport of basketball, as he played varsity high-school basketball at Cameron Heights, and was affiliated with his two University varsity basketball teams. An injury plagued career lead him to complete his Honours Bachelor of Science Degree in Health Sciences, with a minor in Psychology and Biology from Wilfrid Laurier University (2014), and to later obtain his Master of Science in Physical Therapy degree from Queen’s University (2016). His life course has lead him to hold strong beliefs in using evidence based treatment methods in order to improve the health of people in the community he grew up in. 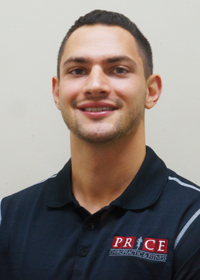 As the resident physiotherapist at Price Chiropractic and Fitness, Stefan believes that believes in empowering people to understand their body and how it works, and in helping them learn how to correct and manage their own dysfunctions. Having gone through debilitating injuries himself, Stefan understands the crucial role that physical health plays in one’s overall health. As such, he believes that the key to healing is to know what is going on, why it is happening, and then addressing the root causes of the problem through an individualized therapeutic experience. This is why he believes that listening to the patient is a key component in understanding and finding the correct combination of exercises, modalities, education, and hands-on techniques to help you achieve your physical potential. Ultimately, his treatment approaches and beliefs are rooted in a passion for health, wellness, and learning.